Roy Hodgson praised Wilfried Zaha for his match-winning performance in Crystal Palace's 1-0 victory over Huddersfield but admitted his side cannot become overly reliant on his goals. Palace have lost their previous 10 Premier League games without Zaha, including a 2-0 home defeat to Southampton before the international break, but he capped his return to the side with a wonderful individual goal at the John Smith's stadium. Zaha's latest strike was his third in the league this season and Palace have only scored one other goal in their five matches, highlighting how crucial he is to the team. 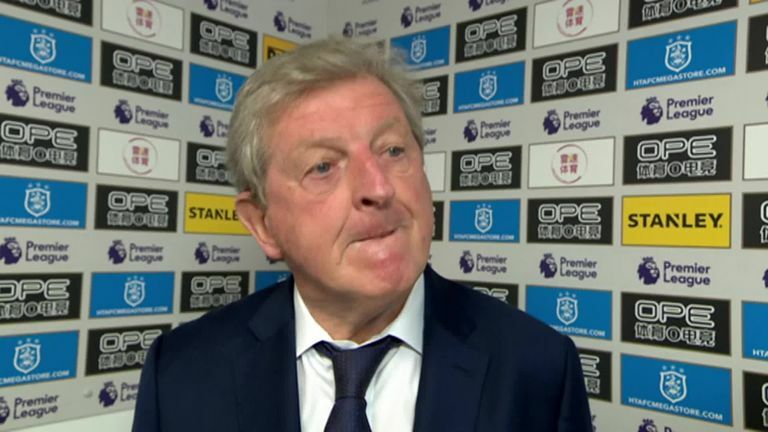 Hodgson acknowledged that Zaha is his team's star man but urged his team-mates to start helping out in order to reduce the goalscoring burden on his shoulders. When asked about Zaha, Hodgson said: "He was a constant threat, wasn't he? He was very close to scoring more than one goal especially early in the second half when we broke behind them on a few occasions but it's nice that he's the match-winner and it's nice that the match-winner was such a good one. "He's vitally important to us, there's no doubt about that. He worries the opposition, his pace and his ability on the ball gives us that constant threat on the counter-attack if we are leading and the other team are trying to throw bodies at us. "This year what he's done apart from his excellent dribbling skills and ability to go past people, he's adding goals to his game. That's yet another goal for him this season and we need people to start chipping in otherwise we'll be relying on him a little too much." Huddersfield played well for much of the game with David Wagner claiming it was their best performance of the season, but their bluntness in attack cost them. Hodgson accepted that Crystal Palace rode their luck at times but thinks they were worthy of their first win in four Premier League games. "I thought we played well throughout the game really but of course as you go into that last 15 minutes and it's only 1-0 you always worry that something is going to bounce the wrong way in the penalty area," he said. "We had a stroke of good fortune when that shot at the end got deflected and went past the post just as we did when that Mooy strike hit the post. "Apart from that I thought we controlled the game quite well and on the counter-attack we had our own chances to be fair. Even the second goal [from Kouyate] we felt was a bit soft and could've stood. "But the important thing was to win the game and it's important to know that your team can stand up to pressure."